You are buying the True Metrix Glucose Test Strips 100/bx & 100 Lancets With Meter. ADW offers the complete line of glucose meters and test strips from Nipro Diagnostics, including their newest - True Metrix. We offer this product line in a combination of ways to best suit your needs. Trust ADW Diabetes for all of your diabetes testing supply needs. 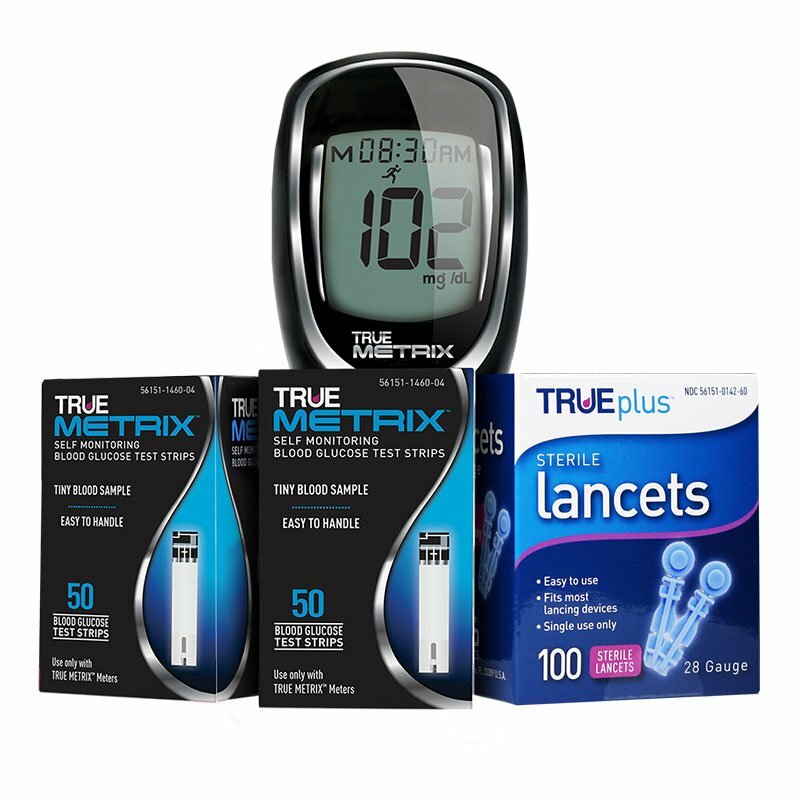 The True Metrix Glucose Test Strips box of 100 & 100 Lancets With Meter features advanced technologies - the meter, a complex algorithm, chemistry and electrodes, on the test strip work together as part of the True Metrix Self-Monitoring Blood Glucose System to produce accurate results. With True Metrix accuracy is confidence. Triple sense technology automatically detects, analyzes and corrects variables in each blood sample to ensure proven accuracy and confidence in results. The Easy-to-use True Metrix Self-Monitoring Blood Glucose Meter with advanced event tags empowers users to make the connection betweeen personal lifestyle and results. Providing this information helps users make informed choices to actively manage diabetes. Tiny, 0.5 microliter blood sample. Detects sample environment, sample size, control solution. Analyzes environmental and physiological factors. As Fast as 4 seconds. Tiny 0.5 microliter sample size. Store 500 results with time/date. 7, 14, and 30-day averaging. Worked well upon arrive but in a few days it often showed error once the strip was placed in monitor. Excellent product, very happy, so easy to use everywhere. Meter, test strips and lancets all came promptly. Had no trouble with setup buttons. The meter works as far as testing the blood sugar (which is the most important thing), however the buttons on top of meter for changing date/time do not work. You would think you could have a meter that does both, test blood sugar & change the date/time. You get what you pay for I guess.